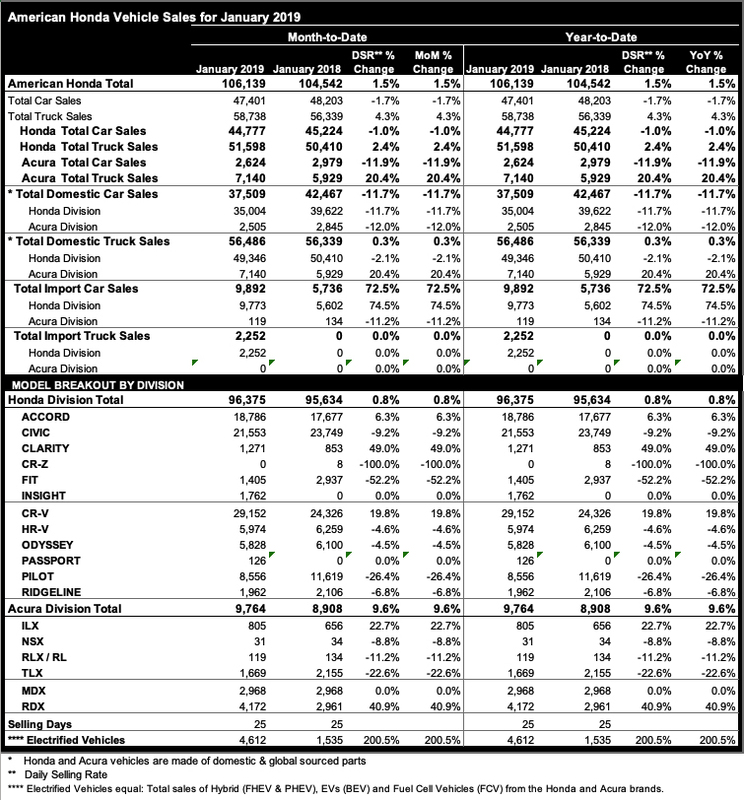 Sales HighlightsContinuing sales momentum from late 2018 led the Honda brand to a new January truck sales record—a strong start for 2019 despite severe winter weather that suppressed car shopping in the last week of January. CR-V was the biggest gainer, and Accord had a strong month as well. Civic finished 2018 as America's top retail-selling car and is the best-selling vehicle in the U.S. millennial, multicultural and first-time new vehicle buyers. Sales HighlightsAcura brand sales withstood the polar vortex in late January to post a 9.6% gain for the month, with RDX leading the brand with a 41% increase. The Acura brand was born in the U.S. and with 5 out of Acura's 6 models built in Ohio, about 99% of all Acura sales are made in America. *INFINITI sales total included for reference. 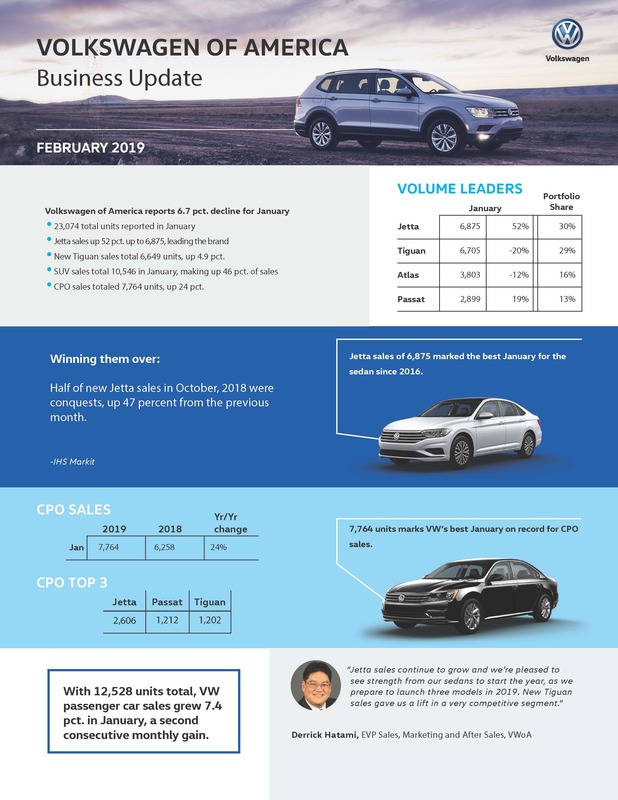 For more information on INFINITI’s January sales performance, please visit INFINITINews.com.NOTE: To ensure consistency in global sales reporting, Nissan North America calculates monthly variances on a straight-percentage basis, unadjusted for the number of selling days. January 2019 and January 2018 each had 25 selling days. Rio, Soul, Optima and Sedona Post Double Digit Year-Over-Year IncreasesIRVINE, Calif., February 1, 2019 – Kia Motors America (KMA) today announced January sales of 37,376 vehicles, led by the Soul which posted a 19.5-percent increase over the same period last year. Overall, Kia sales are up 4.9-percent year-over-year. they sold 3 LFA though. ROCKLEIGH, N.J. (February 1, 2019) - Volvo Car USA, LLC, (VCUSA) reported U.S. sales of 5,854 vehicles for the month of January, an increase of 5.2 percent versus January 2018. The XC60 was the top seller for the month with 1,471 vehicles sold followed by the XC90 with 1,427 vehicles sold. “2019 is off to a good start, with our best January in a decade and solid growth posted in our retail business,” said Anders Gustafsson, President and CEO, Volvo Car USA.